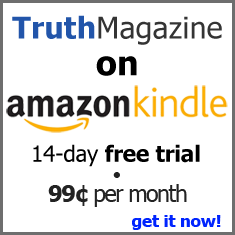 Let me begin by thanking Johnie Edwards for inviting me to have a part in this special issue of Guardian of Truth. I hope our study will be a benefit and help in understanding a misunderstood Bible phrase. Our task will be to discuss Romans 11:25, "Until the fulness of the Gentiles be come in." No, Paul has clearly shown, that by faith in Christ, is the only way the Jews (or Gentiles for that matter) can be saved. Romans 11:23, "And they also, if they abide not still in unbelief, shall be grafted in: for God is able to graft them in again" (cf. Rom.1:16-17). Peter said, "But we believe that through the grace of the Lord Jesus Christ we shall be saved, even as they" (Acts 15:11). Yes, the Jews are saved the same way the Gentiles are saved. Not in mass, or nationally; but individually, person by person, those who believe and obey the gospel! In researching this verse, brethren have set forth various viewpoints as a way of explanation. For the sake of brevity and because of limitations of space, you could check the various commentaries, workbooks, and other works to see what has been said by others. Paul in Romans 11 is dealing with the thesis of the rejection of the Jews. "I say then, Hath God cast away his people? God forbid. For I also am an Israelite, of the tribe of Benjamin . . . Even so then at this present time also there is a remnant according to the election of grace" (vv. 1, 5). No, God has not cast away the true Jew, the one who has believed in Jesus Christ. Paul is "exhibit A" that such an idea is wrong. Yes, most of the Jews had rejected Jesus in unbelief, and God used this for good, for the gospel was spread abroad among the Gentiles. "I say then, have they stumbled that they should fall? (i.e., stumbled as to never to come back, or fall because God didn't care? No, it was because of unbelief they were broken off (v. 23, DLM) God forbid: but rather through their fall salvation is come unto the Gentiles, for to provoke them to jealousy" (see v. 12 also). Yes, God made something good to come out of something bad. Paul then uses the illustration of an olive tree to make his case (vv. 16-24). Some of the natural branches were broken off, the unbelieving Jews. Believing Gentiles were grafted in as wild olive branches. The natural branches were not broken off so these wild olive branches could be grafted in. The Gentile brethren did not need to get high-minded and boastful about the situation, but fear, for they could be cut off also! The Jews could be grafted back in, if they would leave their unbelief. For surely if wild olive branches can be grafted in, how much more the natural branches! Then in verse 25 Paul says, "For I would not, brethren, that ye should be ignorant of this mystery, lest ye should be wise in your own conceits; that blindness in part is happened to Israel, until the fulness of the Gentiles be come in." Paul did not want the Gentile brethren to become conceited and wise in their own eyes, so he wanted to reveal a mystery to them. Let us look first at what the phrase "until the fulness of the Gentiles be come in" means. Could it mean, until the Gentiles be converted and blessed by the gospel? No, for this has already taken place (Acts 10, 11). Could it mean, until the gospel is spread throughout the Gentile world? No, for Paul said that had already taken place (Rom.10:18). Could it mean, until all the Gentiles be convened? No, this will never happen (Matt. 7:13-14). Could it mean, until the church is made up completely of Gentiles? No, when Jews are yet being convened, yeah, even in our day (e.g., Bob and Steve Darnell), how would this revelation have helped the first century Christians, seeing this idea has not come to pass even today? The only passage I can think of that would help explain this phrase is Luke 21:24. Jesus foretelling the destruction of Jerusalem says, "And they shall fall by the edge of the sword, and shall be led away captive into all nations: and Jerusalem shall be trodden down of the Gentiles, until the Gentiles be fulfilled." The phrase "until the times of the Gentiles be fulfilled" means God's use of the Gentile nations to punish his people and his holy city. When Jerusalem was destroyed, God would never again use the Gentiles as he had used the Gentile nations of Assyria, Babylon, and Rome to punish his people, the times of the Gen-tiles were fulfilled, or the fulness of the Gentiles be come in. Thus I take Paul to be saying that when the destruction of Jerusalem would be fulfilled (the fulness of the Gen-tiles be come in) the blindness or hardness that afflicted much ("part") of fleshly Israel would leave them. What is this blindness and veil that hardened much of Israel? I suggest that it was the same mentality and frame of mind that was thawing and tempting the Hebrew Christians back to Judaism. The Jews had the Temple with its goodly stones and gifts (they have had this attitude before, cf. Jer. 7:3-5); they had the Levitical priesthood with all the special robes and garments; they had the animal sacrifices and the pageantry associated with it; they had a "great" city that was rich and was the place for the center of their religion; they had a rich history, in which Jehovah God had worked in their midst and in their behalf; they had the promises, and that special promise of a Messiah who would come and lead them back to world dominance (their misconception); they had the high and mighty counted among their number. And what did Christians "have"? A simple worship; no great temple or cathedrals, for they met in homes or "store fronts"; a membership made up mostly of "common people"; a "new founded" religion; they were small in numbers (that "little bunch"); Gentile members; and were persecuted everywhere. This is why most of the Jews were blinded, as they looked at the gospel. They failed to see by faith, the superiority of Christianity, and it was this same problem that was tempting the Hebrew Christians back to Judaism. When Jerusalem was destroyed, the Jews that were left (a large number of them though were killed and died in unbelief, so sad) would no longer be blinded on these kinds of things associated with the temple. They may have been blinded by other reasons, as the Gentiles were (and as men are today), but not by these things. After the destruction of Jerusalem there was a great surge of evangelism in the world, which would have included evangelism among the remaining Jews also. "For as you were once disobedient to God, yet have now obtained mercy through their disobedience, even so these also have now been disobedient, that through the mercy shown to you they also may obtain mercy" (Rom. 11:30-31). In Revelation 3:9 we read, "Behold, I will make them of the synagogue of Satan, which say they are Jews, and are not, but do lie, behold, I will make them to come and worship before thy feet, and to know that I have loved thee." Jesus is saying that the Jews would come to recognize that God's people were Christians, and I would take it also, that some would be converted by this language (cf. 1 Cor. 14:25). And so, in this manner, in this way; in what manner? In what way? By becoming believers in Jesus Christ, all Israel, like the remnant, like the Gentiles, and like people today, shall be saved!